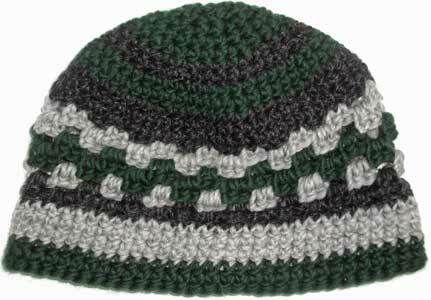 Reversible beanie hat, crocheted in the round, no seams. 100% bulky wool yarn. Hat sides and top are nearly 1/4″ thick. Brim and Top are solid sections. Middle design pattern alternates yarn with open spaces. Men’s Size Large: Circumference: 26″ stretches to 27 1/2″. Height: 8 3/4″ stretches to 10″. Nearly flat top, slightly fuller sides allow room for thick hair, ponytail, Afro. Firm-finished edge stretches and returns to close-fitting shape.